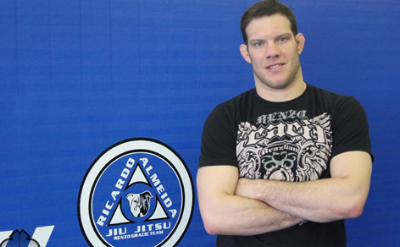 Ricardo Almeida is a legend within the worlds of MMA and Brazilian Jiu Jitsu. Owner of the same academy that houses UFC fighters Frankie Edgar, Katlyn Chookagian, and Eddie Alvarez, Almeida has a long and storied career. He began his journey under the tutelage another legend, Master Renzo Gracie, and ultimately became Gracie’s very first direct black belt. Beyond Almeida’s many accomplishments, which include being a UFC fighter, and a champion in Abu Dhabi, IBJFF, and Pancrase, he says what holds the most value to him is being a good coach and instructor. “Competing is never easy. Victory cannot just be declared, you still must go in and fight,” Almeida says. Despite everything that he has done in the past, what is important is the success of his team. He recently competed alongside his students at the IBJFF No-Gi Pan Ams and won gold in his current category of Heavyweight. It’s no secret that the Gracies have the most illustrious name in Brazilian Jiu Jitsu. However, Almeida takes his part in that lineage very seriously. As a long-time practitioner, Ricardo has found that the most important virtues that come from training are perseverance and patience. He has seen many students completely transform themselves, simply by continuing to come back. While MMA continues to grow in popularity, so has the “Gentle Art” of Jiu Jitsu. Almeida says he thinks it is only the beginning. After training for more than twenty years, what could possibly be his favorite part of the journey so far? Could it be receiving his black belt from one of the most famous Jiu Jitsu practitioners in the world? Being King of Pancrase or winning his bout in Pride? Showing great humility, the things that have given Almeida the most joy have nothing to do with himself.